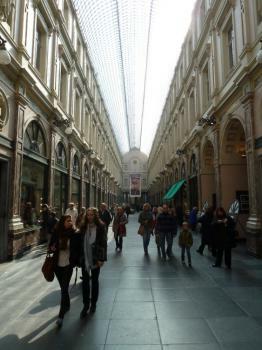 Les passages de Bruxelles / Les Galeries Royales Saint-Hubert is part of the Tentative list of Belgium in order to qualify for inclusion in the World Heritage List. This is the first shopping passage in the world and the predecessor of the modern shopping mall. It's ajacent to the only inscribed Grand Place and might be considered as an extension. The galerie itself is nice, but, as concluded by other reviewers, nothing too special. Many typical chocolatier, two cafes, a cinema, a theatre and some souvenir shops. It is just a single long corridor, remindig me mostly of Galleria Vittorio Emmanuele in Milan which is from about the same time. I agree with Clyde that if one of them merits an inscription, it should be the one in Milan. I live in Belgium and visited this tentative site several times. It's very close to the Grand Place. Worth a visit especially for the divine Belgian Chocolate shop inside but it does not merit a WHS status in my opinion. Milan's Galleria Vittorio Emanuele II is much more impressive and still doesn't deserve a WHS status. Apparently Galerie St Hubert was the first shopping gallery in Europe and it is rather nice. I have been to other and better examples around Europe but this is certainly a nice diversion just around the corner from le Grand Place. I wouldn't say I was massively impressed by the shops though, and some of the surround streets show Brussels at its worst; the Belgian and EU capital, still disappoints me each time I visit, despite the wealth of attractions it has, it always seems to be much less than the sum of its parts. The gallery is a worthwhile detour, however the best attraction is the unpretentious and delicious Bistro Arcadi at the end furthest from la Grand Place, whilst across the road a la Mort Subite has a wonderful selection of Belgium's finest product, beer.